The Complete Infidel’s Guide to the Koran exposes how the Koran incites hatred and violence and is anti-democratic, anti-freedom, and intolerant of any other ideology. 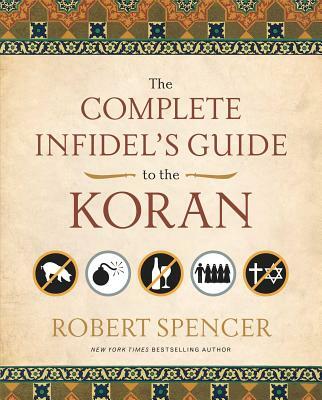 Stripping out the obsolete debate, The Complete Infidel’s Guide to the Koran focuses on the decrees toward Jews and Christians, how they were viewed by Muhammad, what “the infidels” have done wrong and what the Koran has in store for them. The Complete Infidel’s Guide to the Koran is the essential primer to comprehending one of the most cryptic and misunderstood religious texts. Robert Spencer sheds light on the violence inherent in the Koran and reveals the frightening implications for the War on Terror, the U.S. and the world. ROBERT SPENCER is the director of Jihad Watch, a program of the David Horowitz Freedom Center. He is the author of the New York Times bestsellers The Politically Incorrect Guide to Islam (and the Crusades) and The Truth About Muhammad, as well as six other books on Islam and terrorism. He is a weekly columnist for Human Events and the website Front Page Magaizine. His articles on Islam and other topics have also appeared in the New York Post, the Washington Times, the Dallas Morning News, FrontPageMagazine.com, WorldNetDaily, Insight in the News, Human Events, National Review Online, and many other journals. He has appeared on FOX News, CNN, PBS, and C-Span and numerous nationally syndicated radio shows, including Michael Savage’s Savage Nation, the Laura Ingraham Show, the G. Gordon Liddy Show, Janet Parshall’s America, the Michael Reagan Show, the BBC, and Vatican Radio discussing jihad, Islam, and terrorism. Spencer has studied Islamic theology, law, and history for more than 25 years.